Chinese university students’ struggle at Tiananmen Square for better living conditions; Kaiser workers’ fight against two-tier wages and the continuous miner; and today’s Hong Kong Youth’s Umbrella Revolution, Occupy Movement and Black Lives Matter all show that workers are alive in struggle. 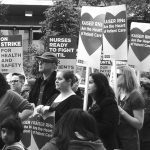 A critique of HMO practices that sanction nurses for giving quality care, showing the relation of that practice to what Marx worked out about labor time. Contract bargaining has begun between the California Nurses Association and Kaiser Permanente. CNA has steadfastly rejected management’s demand to hold negotiations in closed sessions. Healthcare reform took cost-control ideology to a whole new level. The Affordable Care Act (ACA) has been transformed into its opposite by the HMO industry which sacrifices the lives of patients and workers alike for the sake of fiduciary health. 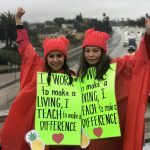 On Jan. 6, RNs from the California Nurses Association (CNA) picketed a new state-of-the-art facility at Kaiser Oakland to protest increasing restrictions on access to care while decreasing frontline care staff. The opening was timed to coincide with the implementation of the Affordable Care Act (ACA). 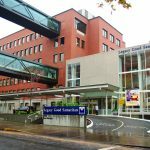 Kaiser imposed added staff cuts in the same breath as it announced the “Total Health Incentive Plan” campaign. While it is promoted as voluntary, the program hides the reality of the health of workers and patients sacrificed daily in the name of cost efficiency. Workers realize they risk their own health and the health of their patients when they come to work sick. Yet we are called into disciplinary meetings when we exceed the company set limit in the number of sick days. The phenomenon of human beings losing a race with machines is especially pernicious in the healthcare workplace. The computer has become the virtual boss of everyone in the shop, by setting the pace of everyone’s job. Workshop Talks: Who lost to SEIU?